I've been hunting for patterned sheets for a few years now and they just don't seem to 'do' them here in England. I still wish I had bought the ones I found in New York a couple years ago but it was during a huge snow storm and we were worried about whether we'd need the money (Airports were closed with no indication of when they'd open and hotels had hiked up their rates). 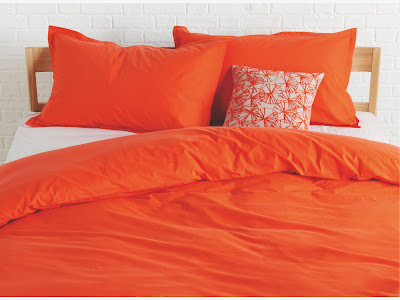 Until then, I could handle this bright orange duvet cover set in my bedroom. I already have a set of orange sheets but this set from habitat really POPS.